This challenge is for a simple one pot (Dutch oven or Potjie) MAIN DISH. Something that would be good while camping. Once something goes in the pot it stays there until it’s served. No chili or pizza, we already did those. Inspired by my current head cold, I thought that a Chicken noodle soup would be nice. However, I usually like Chicken Noodle soup with a slice of bread. The slice of bread doesn’t fit the “One Pot” requirement so I decided to make dumplings instead of noodles. That way, my dish is all in one pot & still more filling than just soup. 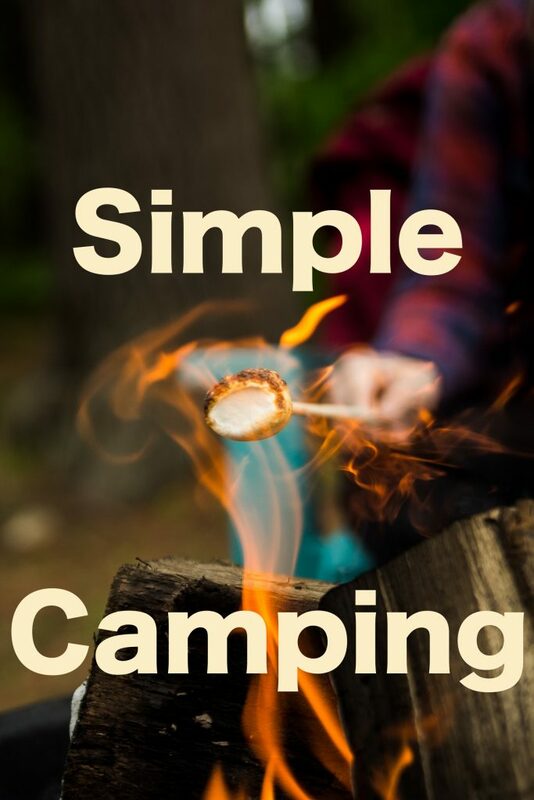 Since this should be a camping recipe, I did everything by hand. 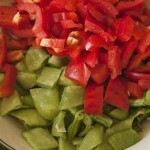 This recipe is really easy to do everything by hand. 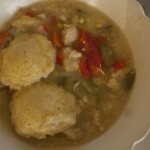 Chop some veggies, mix together some dumpling dough & you’re done. 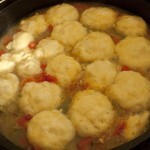 This recipe is my own creation and I was surprised to find it really tasty with the dumplings instead of the noodles. 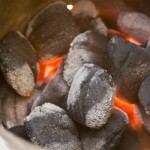 Start by heating your 14″ Dutch oven on one ring of briquettes (below). When the oven is hot, add the onions & chicken. 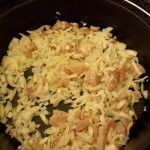 When the chicken & onions have browned, pour the water in. Add 6-8 briquettes to the bottom & put a ring of briquettes on the lid. 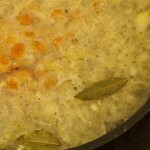 Once boiling, add your bay leaves and carrots. 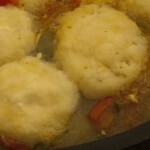 While the carrots are cooking, make your dumpling dough. 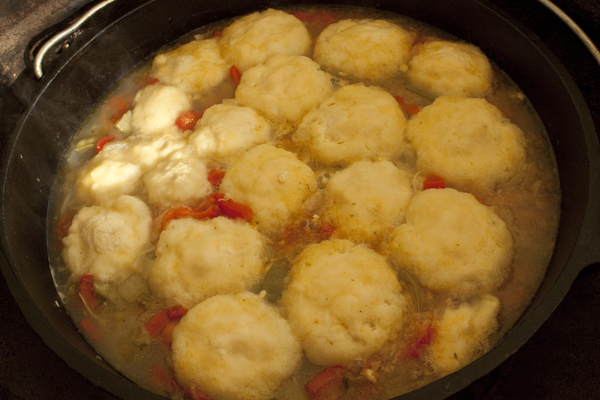 Once the carrots are soft (about 30 min), add the remaining vegetables & 3/4″ round dumplings (The dumplings will double in size). 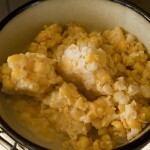 Boil for another 30 minutes or until the dumplings are completely cooked.